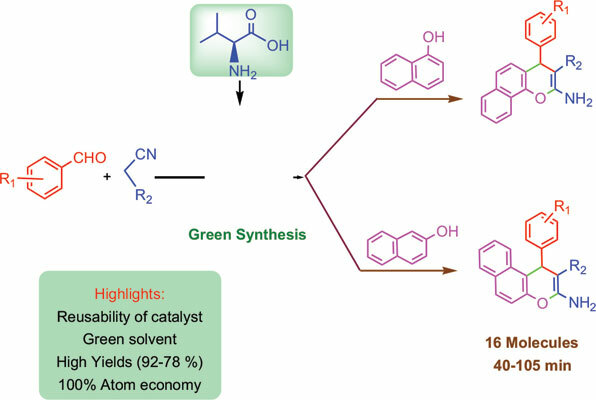 Background: A versatile, facile, one-pot multi-component protocol for the synthesis of 4Hbenzochromenes using L- valine as organocatalyst in aqueous medium has been developed. Methods: Superior catalytic performance of L- valine, operational simplicity, easy workup procedure and recyclability of the catalyst are the key strengths of reported strategy. Results: Therefore, it is a green alternative to the existing protocols. Conclusion: This method offers mild reaction conditions, the use of easily available cheap reagents, short reaction times, excellent yields and high atom economy. L- valine, amino acid, multicomponent, 4H- Benzochromenes, water, organocatalyst.